California, USA. Located Twitter alerts its millions of iOS app users what’s happening on Twitter. To do it, Twitter has embedded Push notification feature in its app. You’re a twitter fan and miss even single push notification alert of your followers or poll or other activities available on iPhone twitter app. We can understand your pain. Sometimes you maybe try to disable push notification for some action due to repeatedly notifications sound, but at time notification button looks grayed out. 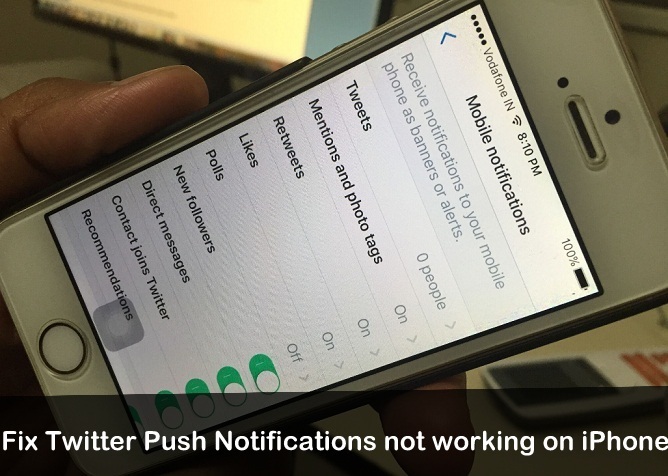 So all about Twitter notification troubleshooting to resolve Twitter Push notifications not working on iPhone, iPad after update iOS 11 and update iOS 10. As our opinion, you should follow given below ideas. To get the better experience of twitter iOS app, though you consider latest iOS or latest operating system on your iPhone, iPad and iPod Touch. If you still using iOS 7 or earlier, twitter app may not update to recent versions. Generally, Twitter gives the separate button to control (enable/disable) notifications for Tweets, Mentions and photo tags, Retweets, Likes, Polls, New followers, Direct messages, Contact joins twitter and Recommendations. 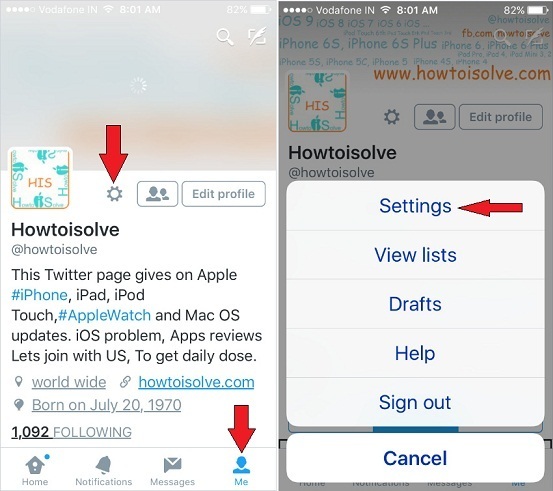 For latest Updated Twitter iOS App: Following steps will help you to enable Twitter Push Notifications. Open Latest Twitter App on your iPhone > After log-in successfully tap on your Profile icon appear upper-left side corner > Tap Setting and Privacy > Tap Notifications > Under Preferences section tap on Push Notifications > Now, you can customize here all notifications including Tweets, Mentions and replies, Retweets, Likes, Photo tags, New Followers, Direct Messages, Contact joins Twitter, and much more. Step 1. Launch the Twitter app on iPhone home screen. Step 2. Tap on ME icon and then tap on Settings (Gear) icon. Step 3. You will get a popup select Settings. Step 4. Tap on Notifications. Step 5. Choose Mobile Notifications. Step 6. 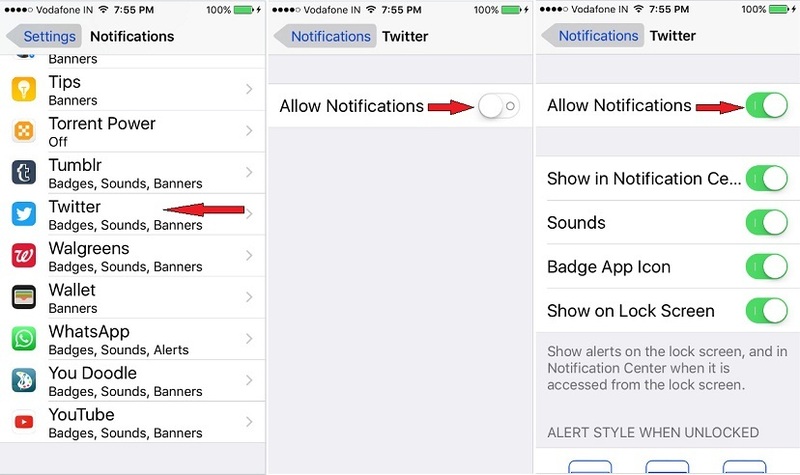 Now see carefully here notifications for the activities is turned on which you want to get alert sound. 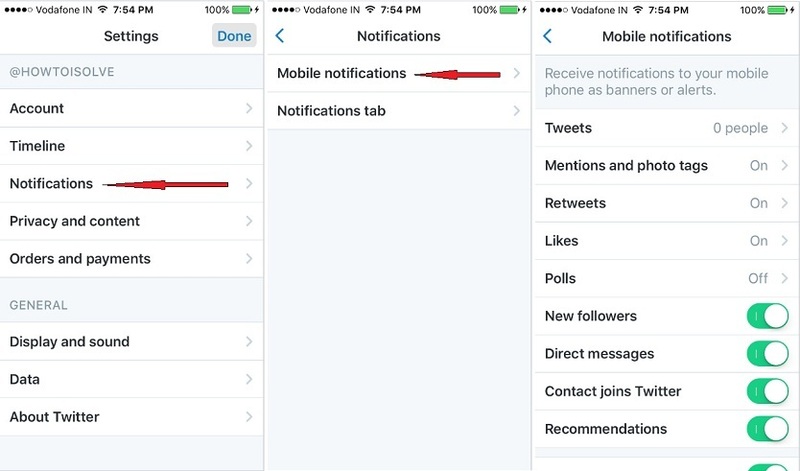 Now check out on your iPhone settings app notifications for the Twitter app is enabled. Settings – Notifications – Twitter – Turn Allow Notifications. Above ways are okay. However, you don’t get twitter push notification then go with next clue. Make sure your iPhone firmware is iOS 8 or later. To check out, it goes with below steps. If any update available, please update it. Then try again. Fix 3. Uninstall the Twitter app and Re-install again. Fix 4. Check your iOS device time zone is okay as per your current living place. Settings – General – Date & Time – make sure the option to Set Automatically is enabled. If none of the above ways cleared your issue and did you find any new way to resolve Twitter Push notifications not working on iPhone, iPad problem? Please share it in the comments box. We will permit right information as soon as possible.